Everyone at Mikkeller HQ is looking a little more tired than usual this morning. Having just returned from running the Berlin half marathon, there are a few sore thighs around. “We had a killer party at the end of the run too,” explains Soren Runge, who heads up Mikkeller Running Club. There was double reason to celebrate, as the run coincided with the grand opening of the company’s new Berlin bar on TorstraBe in the heart of the city’s Mitte district. Taking part in the race were runners from MRC chapters from around the world. People had journeyed from as far away as Liverpool and Moscow and the team here was part of a group of 78 people who travelled together on a bus from Copenhagen. Inspired by Mikkel’s own love of running - he was once the fastest man in Denmark - MRC is a worldwide, grassroots movement of people who meet up once a month to run, then enjoy beer together. “So many people take running too seriously - we wanted to do something much more inclusive and fun,” Soren says. Conceived back in the kitchen in Vesterbrogade, where it all began, Mikkel and Jakob were concerned that their beer drinking was making them fat. Not wanting to cut down on beer, they decided to start running. “They had no idea it would grow into what it has become”, Soren says. Set up mostly by local volunteers, there are already chapters in places as diverse as Sao Paolo, Russia and the Faroe Islands, where the company has recently opened a bar. With more than 100 members of the Torshavn chapter, the club is testament to the excitement around the opening of a Mikkeller bar in this seemingly unlikely locale. It is of course no surprise that the biggest chapters are in cities where Mikkeller has a bar, especially in its home of Copenhagen. It is said that around 10% of the population here runs regularly and, with it being such a popular sport, there are MRC groups going out almost every night of the week. “A year ago, we would have hoped to reach 100 chapters by now. We’re at 150 and could well hit 200 by the end of the year,” he says, visibly excited by how fast his baby has grown. The company has hosted ‘World Beer Run’ events in places such as the small Portuguese town of Cominha, home to the Artbeerfest. The town’s 10,000 population more than doubles during this world-famous beer festival and MRC plans to offer a 10k route for participants at the festival again this year. When the brewery recently opened Mikkeller Downtown LA, more than 200 people turned up for the first run. Again in the US, Mikkeller plans to host a World Beer Run event in partnership with 18th Street Brewing in Indiana, whose founder Drew Fox is also a runner. 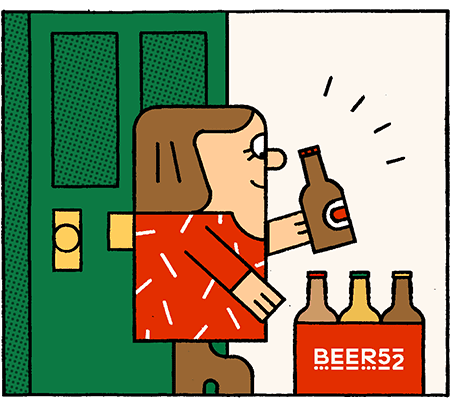 Their dream is to one day host a World Beer Run in every city where Mikkeller has a presence. As part of MBCC, there will be a 5k run for participants, with stops for eight or nine beers along the way. On Sunday 14 May, there will be a chance for any eager runners to take part in the Danish Championships of the ‘Beer Mile’ competition. Originally started in the USA (where else? ), the concept is simple and awesome. Entrants run a 400m circuit, down a beer and then repeat it three more times - ultimately running a mile, punctuated by four refreshing beers. “It’s not about being the best runner - it’s about being the best beer drinker,” Soren says, laughing. The competition might sound like a joke, but there is a long list of rules and, unfortunately for some, vomiting is punished with another lap of the circuit. Apparently, the secret is also to train with sparkling water. Not only do you get used to drinking carbonated liquid at high speeds while you’re running, but you can safely drive a car afterwards. Conveniently enough for the planning of these antics, the route around the barrel room at Mikkeller Baghaven is 400m long. Despite coming at the end of this epic beer festival, with all the hangovers that entails, this promises to be a fun end to the week. Mikkel even hopes to use the opportunity to beat the Danish record for the ‘Masters’ age group category of the competition. To achieve this, he’ll have to run four laps and drink four beers in under five minutes and four seconds. Adding to the event’s excitement, Mikkel has invited along the previous winner to defend his title. “Hopefully he’ll join us at MBCC the night before for a few beers, so they’re on an even footing on Sunday morning,” Soren jokes. I look forward to watching this pair battle it out in this truly mind-boggling feat of sporting ability. ”It’ll be another great party if he pulls it off,” Soren promises. In true Mikkeller style, it has brewed a beer specifically for the running club. “It’s a great IPA, but we made a few alterations to make it easier to drink as part of Beer Mile,” he tells me. If you’d like to get involved in the race, be sure to register for a ticket at the Mikkeller web shop.